THE life of a headline writer is perilous. I should know – it’s one of the daily duties of my job as a newspaper sub-editor. You have to write to fill whatever limited space you’re given – which often means leaving out the words you’d really like to use – and, of course, you must watch out for embarrassing ambiguities. Your aim is to make the reader want to read on while reflecting the content accurately without telling the whole story. It takes a special kind of talent to consistently write good headlines and, woe betide you if you’re having an off-day. In one slip of the figurative pen, all the great stuff you’ve ever written flies out of the window. Wiped from everyone’s short, smug memories. Your lapse is there in black and white (unlike the web, where you can sneak in and delete any blooper in an instant). For 24 hours – until the next newspaper appears – your face is so red you could stop traffic. This entry was posted by stevieg on Thursday, December 2nd, 2010	at 10:02 am	and is filed under A Passion for Words, General	. You can follow any responses to this entry through the RSS 2.0	feed. You can leave a response, or trackback from your own site. Funny stuff, Stevie G! 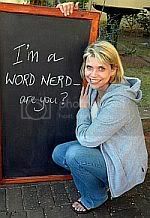 You are my favorite word nerd. Thanks, Amy. Appreciate your support. I don’t think those bridges are going to stay new for long if they’re only held up with red tape – that was my favourite. Hm, actually, I’m not sure if that’s really my favourite – they’re all so good! Amusing list, and thanks for sharing it.